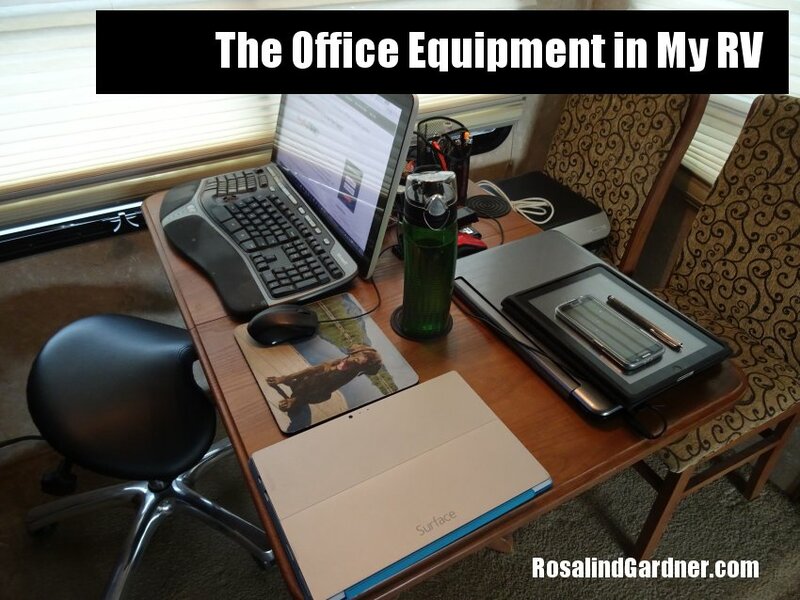 I've been blogging from our RV for the past year, and I thought it would be fun to show you the office I've been working in, as well as provide you with a list of my blogging equipment, both necessary and nice-to-have. I bought a Sony Vaio All-in-One specifically to use while blogging on the road as I wanted a large screen and a full-sized keyboard, but didn't want to deal with having to pack up a large computer every time we moved the RV to a different campground. As it is, I unplug all the components and throw the computer under the blankets on the bed when we travel. When I have to fly somewhere and will be away long enough to need more functionality than provided by an iPad, I take my Surface PRO, which I carry in a neoprene carrying sleeve. I usually connect to the Internet through a Galaxy Broadband account using our satellite dish (see picture at the bottom of the post). I tend not to trust unsecured public connections (free Wifi) available at RV parks. I took the picture above with my Sony DX-HS60V. Taking your own pictures to use as featured images saves money on stock photo images. Samsung Galaxy S6 in a case with a tempered glass screen protector. I'll be upgrading to the Galaxy S7 in the near future, for improved camera quality and water resistance. I use a powered USB hub in the RV. I have an HP Envy 5530. Normally I wouldn't bother with having a full-sized printer in the RV, but because we anticipated having to print numerous documents related to the house-building project, I just took the home printer and stuck it on the dining room chair. After years of using what seems like SCORES of different water bottles, I finally found one that I LOVE — the metered Thermos Nissan Intak hydration system. Easy to drink from, no leaks and easy to clean. YAY! Shown in the picture above is my Garmin Forerunner, which when not in use is plugged into the USB hub to keep it powered up and to sync it with Garmin's online activity tracker. Of course, you don't NEED one of these, but it is a good reminder to get outside and play to keep your body fit and healthy so that you can blog another day. That short list of equipment to run my affiliate marketing business from my RV should be proof positive that you don't need a lot of either space or equipment to work as an online entrepreneur or an affiliate marketer. The picture above was taken at White Tank Mountain Regional Park just west of Phoenix in March 2016. To learn more about the places we camp, visit my personal blog. This is definitely to way to do any computer business. North in summer , south in winter.